We would like to welcome you to West Highlands United Methodist Church. 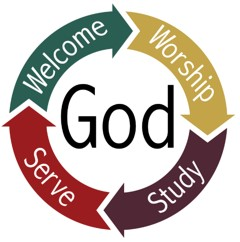 We are a church with a simple purpose: to Welcome everyone, Worship God, Study God's Word, and Serve Others. We hope you will join us. There are several ways to get to know us. You can join us for our worship service on Sunday. The worship service is at 10 a.m. followed by a time of fellowship, with coffee and snacks in a relaxed setting. You and your family can join one of our Study and Grow activities. Children, Youth, and Adult Small Groups get together to grow our relationship with God and each other. See our Study and Grow page for more information. If you have a heart for service, see our How We Serve page for various ways we serve others. You can attend one of our community and fellowship events. These are shown on our home page under announcements and our News & Events page. You can join our on-going adult fellowship activities including United Methodist Women, Men's Ministry, and NILE. See our News & Events page for more information.